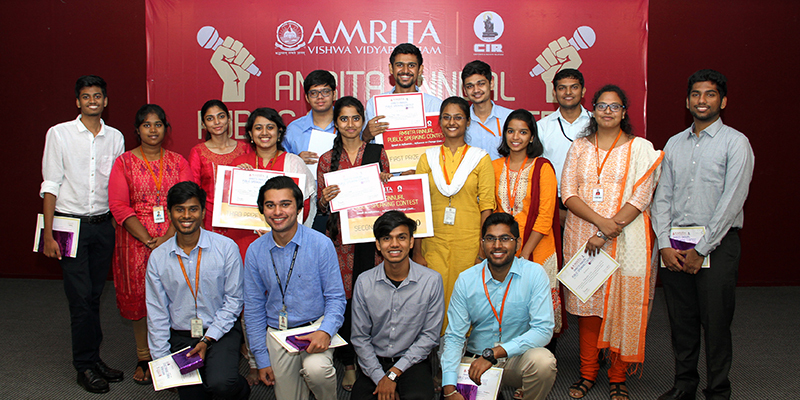 With the noble intention of reviving the art of Public Speaking and helping students cope with the increasing competition in the corporate world, Corporate and Industry Relations (CIR) hosts the Amrita Annual Public Speaking Contest for III year B.Tech students every year. What began as a process of internal assessment for engineering students in the year 2009, gradually evolved into an exciting event with the encouragement of Professor C. Parameswaran, Director, CIR. In the nine years that have rolled by, the enthusiastic participation of the students has only increased and the spirit of the competition has been maintained by a team of Verbal and Communication Skills Trainers who constantly strive to keep this tradition alive. Every III year B.Tech student in his sixth semester delivers a three-minute speech on any topic of his choice, as part of the Life Skills Training conducted by CIR; his own classmates form the audience. Around 1000 plus students from 17 different batches are given a platform to express their views on a variety of wide-ranging topics that they are passionate about. The participants are judged on the following criteria: body language, language, content, tone, style and impact on the audience. Approximately 10-12 students are shortlisted from each class and made to compete with each other in a semi-final round, which again happens in the respective classes. Based on their performance, the most confident speakers are chosen as the finalists of the Amrita Annual Public Speaking Contest. The tenth Amrita Annual Public Speaking Contest was held on 29th March 2018 at Amriteswari Hall; the chief guest was Dr. Harini Jayaraman, Chairperson, Department of English. The contestants displayed their oratorical skills by expressing strong views on a whole range of interesting topics – How smart phones affect our productivity, The world - a less judgmental place, Are we really free?, British colonialism in India, A legacy for the future generation, Greater the difficulty … sweeter the victory, Little Things, Time, True Happiness, Importance of failure, Never give up!, Success, Life Skills, My Queen, Perception of Gender, Being body positive, Superheroes, Everything is fair in love and war. It was a pleasure listening to all the 18 participants and the appreciation was expressed through certificates and books sponsored by CIR. Dr. Harini motivated the students with her inspiring address and rewarded the winners with gift coupons from amazon.in sponsored by Byju’s Learning App. Anand Kumar from the department of Computer Science Engineering won the first prize, S. Smruthi from the department of Electronics and Communication Engineering emerged the first runner up and Meghna Nair from the department of Mechanical Engineering was the second runner up. Congratulations winners!